The proper follow-up to 2006's Olesi comes just in time, right after the light tease that cultivated in Muldrow's spring compilation, Ms. One. 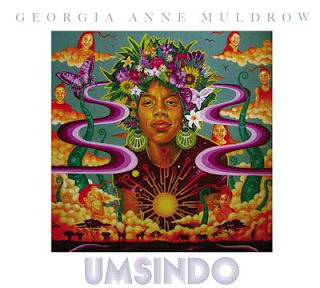 Having released said compilation, a portfolio of sorts that demonstrated her ability as a producer and only showcased her voice and musicianship to a limited degree, Muldrow's Umsindo finds her in fine form, as boldly political as she was three years ago, though now more comfortable thanks to her recent role as mother. Muldrow is a modern-day earth child, as peaceful as they come – look to “Roses” for evidence (a Mos Def-less original, though you may have heard the half-assed addition of his voice on The Ecstatic last June). Her record in full is highly Afrocentric, and though the Zulu tributes can be a bit isolating, the majority of themes here are universally significant. She spent some words on President Bush last May (see “Mr. President” on Ms. One), and now she's playing skeptic toward the current administration on “Caracas”: “Nuclear bombs don't just belong to Osama/they'll soon belong to Obama...I'm not a part of this country/I ain't a part of this policy.” But then, she's got a tribute to Jah in “De Wiz” and to the daughter of her beau (and Umsindo's executive producer) Dudley Perkins in “E.S.P.” And sweet Jesus, her music's thick – the fuzzy feedback of bass on “Seminole Unity Chant,” the lazy melody and complementary live drums of “Okra,” the loose guitar of “So Far.” Never mind the maturity that shows through her lyrics; it's her music, raw and pure, that makes her an essential.